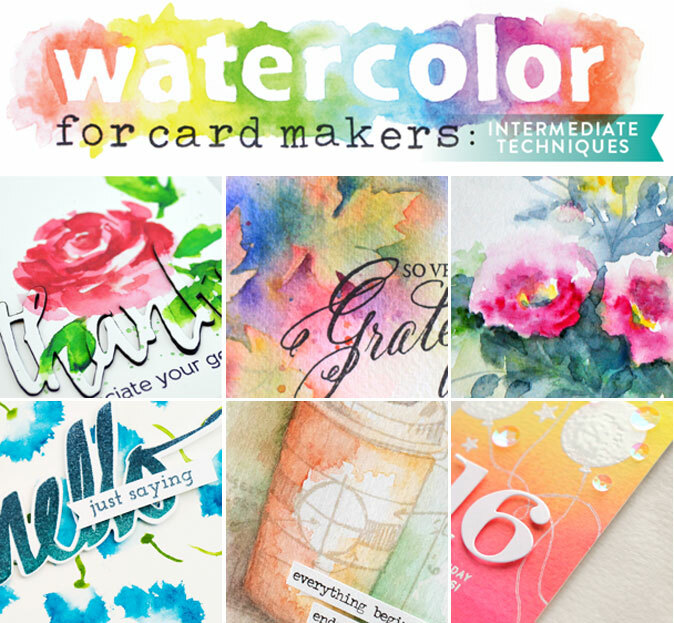 Online Card Classes | Watercolor Class Giveaway! Have you seen the latest class from Online Card Classes – Watercolor for Cardmakers: Intermediate Techniques? I am very excited to be contributing to this class and I am even more excited to take this class myself! Dawn Woleslagle (who is the owner of WPlus9) is an incredible watercolor artist and an amazing teacher and she explains everything so well! You watch one video of hers and you immediately want to go and start watercoloring. I highly recommend this class! To read more about Watercolor for Cardmakers: Intermediate Techniques, head here. Class started today (I’m going into the classroom after I finish writing this post) but you can join anytime! There are lots of videos, examples, downloads, etc. and you will have lifetime access. I have one spot for Watercolor for Cardmakers: Intermediate Techniques to give away. For your chance, please leave a comment below by 11:59 pm EST on 1/27/16. I will randomly select a winner, e-mail and will post winners name in this post. Thanks and good luck! Winner is Carolyn Peeler! Congratulations! You are going to love this class! I love the look of watercoloring ! Thank you for the chance to learn more about this technique! Loving class now I just need time to play lol… Thanks for the giveaway. Just getting into water colouring. This class looks amazing! Sure would love to win this class. I love watercoloring! It’s fast, fun and you get surprising results. WOW!! I would love to win a spot in this class!!! I am always looking for new techniques and just to learn new things!! I’m not very good at watercoloring so this would be a lot of fun!!! I am in awe of the people taking this class – and Dawn herself is a water color expert, so winning a spot would be too cool for words! Thanks for a chance at it. Always love your work and listening to your voice! Beautiful watercolor peeks, looks like a fabulous class! Thanks for all your inspiration and generous giveaway. This class looks amazing. I’d love to learn some new things about water coloring. Thanks for the chance. I would love to win a spot in this class, thanks! I’d really love to win a spot in this class, it looks awesome! Thanks for the chance! I love the look of watercoloring but could really use some instruction. I would love the opportunity to take the class. I would love to learn more about water coloring and improving my technique. I am still trying to get the hang of it. Thanks for the opportunity to win this class, love this creative media & eager to learn! I would love the chance to win a seat in what sounds like a great class! Thanks! Would love to win a spot. Thanks! I would love to learn how to watercolor better! Yana, I love your work, it’s always got that special touch. I’d love to win a spot and learn from you and the rest of the super talented ladies. Thanks for always sharing and inspiring me.